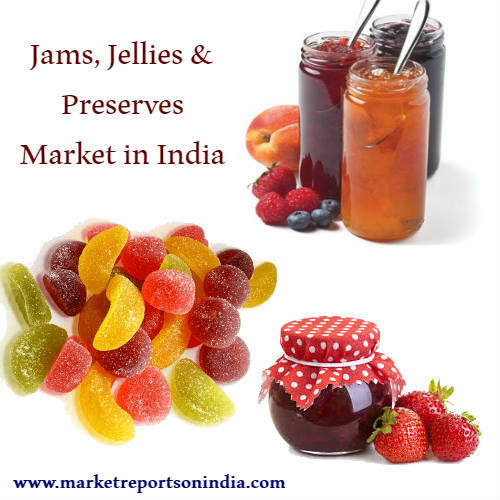 Market Reports on India Provides the Trending Market Research Report on “India Jams, Jellies & Preserves Market” under Life Sciencescategory. The report offers a collection of superior market research, market analysis, competitive intelligence and industry reports. Jams, Jellies & Preserves (Syrups & Spreads) Market in India - Outlook to 2021: Market Size, Growth and Forecast Analytics is a broad level market review of Jams, Jellies & Preserves market in India. Jams, Jellies & Preserves - includes all jams, marmalades, spreadable jellies and preserves. Jams , Jellies & Preserves market in India registered a positive compound annual growth rate (CAGR) of 8.61% during the period 2011 to 2016 with a sales value of INR 4,173.75 Million in 2016, an increase of 8.89%over 2015. The research handbook provides up-to-date market size data for period 2011-2016 and illustrative forecast to 2021 covering key market aspects like Sales Value and Volume for Jams, Jellies & Preserves and its variants Jams, Marmalade, Preserves. The research handbook acts as an essential tool for companies active or planning to venture in to India's Jams, Jellies & Preserves (Syrups & Spreads) market. The comprehensive statistics within the research handbook provides insight into the operating environment of the market and also ensures right business decision making based on historical trends and industry model based forecasting. Overall Jams, Jellies & Preserves (Syrups & Spreads) market value and volume analytics with growth analysis from 2011 to 2021. Get access to authoritative and granular data on the Jams, Jellies & Preserves (Syrups & Spreads) market and fill in the gaps in understanding of trends and the components of change behind them.